When milk prices are low, dairy producers begin to look for ways to reduce the direct input expenses of growing alfalfa. One option that growers have is to purchase lower cost alfalfa seed. Alfalfa seed of modern varieties can cost over $4.00 per pound, while older varieties can be purchased for $2.00 per pound or less. Is this difference in seed cost justified? Short-term price savings can be realized by purchasing inexpensive seed, but long-term profitability may be compromised. This Focus on Forage article will address the value of modern alfalfa varieties and compare the total cost of seed over the life of an alfalfa stand. How do I pick a good alfalfa variety? One of the most important alfalfa management decisions a producer makes is which variety to plant. Hundreds of alfalfa varieties are marketed, and thirty or more new varieties are released each year, making this decision difficult. Several important factors must be considered when choosing an alfalfa variety. High yield potential – Forage yield drives the economics of alfalfa production. While it may appear that two varieties perform similarly, only a 1/10 ton lower yield per cutting can result in substantially lower profitability over the life of a stand. Disease resistance – Multiple disease resistance is an important risk management strategy. Many diseases do not affect the health of the alfalfa plant each year, but having disease resistance can prevent catastrophe and will likely show in large yield differences at least once during the life of the stand. Stand persistence / winter survival – Healthy alfalfa plants that persist throughout the productive life of the crop results in higher profitability. Stand persistence is often influenced by plant health, insect management, soil fertility, and climatic conditions. Wisconsin variety evaluations record stand percentage during each year of the alfalfa test, giving growers and additional tool for evaluating variety performance. Other selection criteria – When other yield, disease resistance, and stand persistence criteria are met, growers may want to consider forage quality, potato leafhopper resistance, or maturity as additional deciding factors. The variety you select should consistently perform in the top half of yield trials in all trial sites and years tested. This is a good indication of stability across different soil types and climatic conditions. How does an older and cheaper variety like Vernal preform compared to modern varieties? 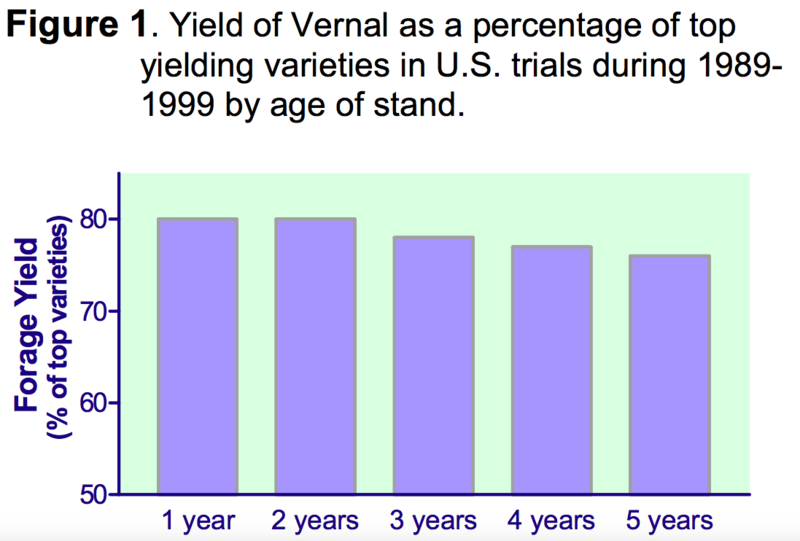 While Vernal has been used as the standard check variety in University variety trials for many years, it has not performed as well as modern varieties. Vernal can perform nearly equal to modern varieties for a cutting or two when all other growing conditions are at an optimum. However, when stress occurs, Vernal does not hold up well, and performance lags. Figure 1 shows the performance of Vernal in University trials around the country. In these studies, the forage yield of Vernal ranges from 76 to 80% of the top performing varieties in a trial. Vernal becomes less competitive with increasing stand age. In low yield environments, Vernal drops to 73% of top yielding varieties (Figure 2). 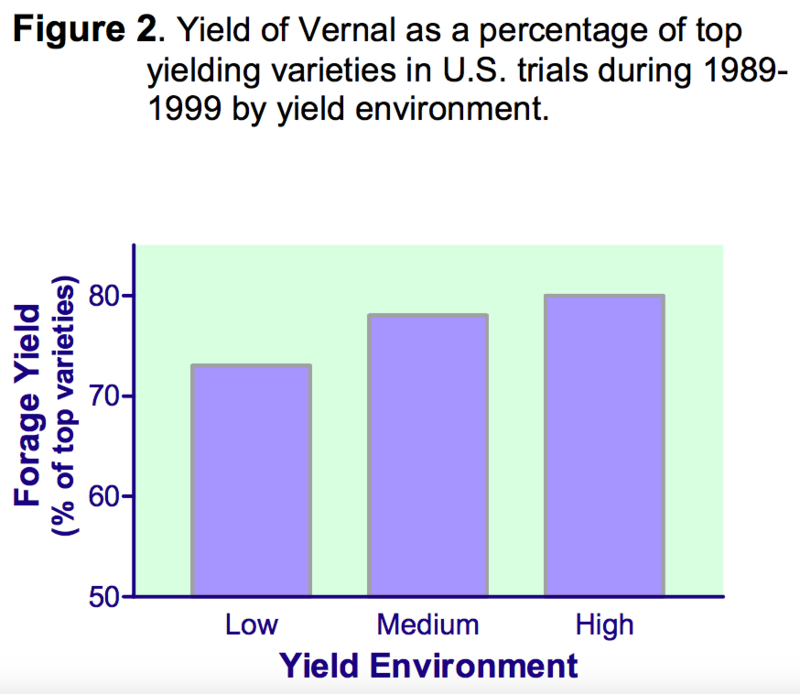 However, in medium or high yield environments, Vernal is slightly more competitive, yielding 78-80% of top varieties. 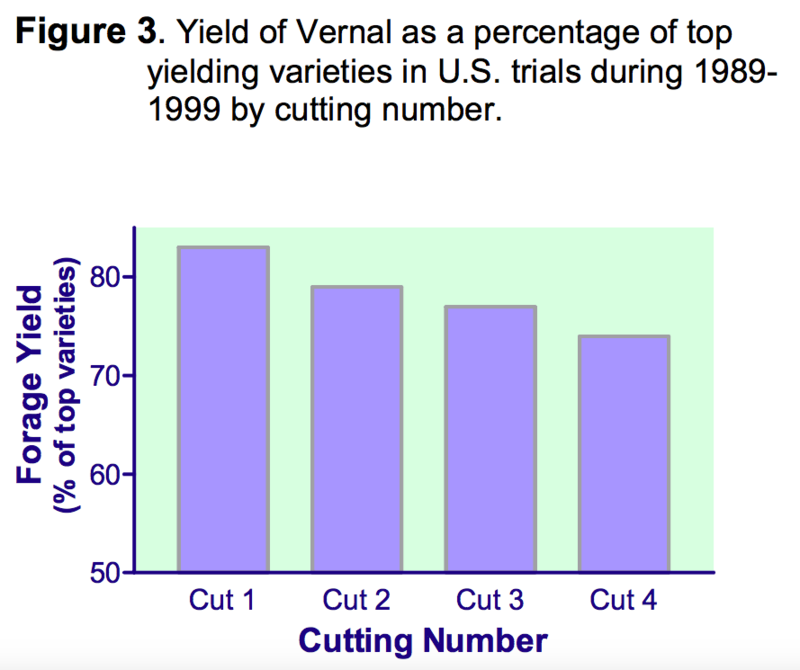 Vernal is most competitive with modern varieties at first cutting, yielding 83% of top performers (Figure 3). By fourth cut, average forage yield of Vernal drops to just 74% of top varieties. This data shows a significant loss of yield potential when seeding Vernal alfalfa as compared to the top performing alfalfa varieties available today. Yield loses of 20-25% during an average cropping season (3-4 ton DM/ac) means that additional seed costs can be recuperated through extra forage production in less than one growing season. In addition, the risk of severe stand reduction due to disease is lower over the life of the stand. Is all cheap seed the same? While the data presented demonstrates the yield potential of Vernal alfalfa, it also represents the potential productivity of other old and/or cheap varieties available to growers today. There are really two sources of cheap seed sold in the alfalfa seed industry today. The first kind of cheap seed is variety not stated (VNS) seed. This seed is produced from older varieties like Vernal or Ranger. The performance of VNS seed is most likely to be poor because of using unimproved genetics. In addition, you do not know what variety or genetics you have purchased. A second type of inexpensive seed is variety blends. Often in years of surplus alfalfa seed production, several varieties are blended together to and sold as an unnamed seed blend. The blended seed varies by dealer and company. However, there is potential for several modern varieties to be included in these blends, making their performance quite good. The problem is that you never know what genetics have been included and at what ratios. There is a chance of getting good quality alfalfa genetics in a blend. Likewise, there is a chance of having poor varieties in a blend. Purchasing alfalfa seed for forage production is an important management decision. The true “cost” of seed is not reflected in the purchase price alone. Planting an inferior yielding variety means that long-term costs of production are higher per ton of forage produced. In addition, more risk is introduced into your operation by buying “cheap” seed. Seed purchasing decisions should be based on variety yield performance, disease resistance, winter survival, and stand persistence. Consult the Perennial Forage Variety Update for Wisconsin (Undersander et. al., 1999) for alfalfa variety descriptions and yield performance data. Finally, there are other questions to ask when purchasing seed. Does the company provide agronomic support services to growers? What is the product warranty or germination guarantee? Will the product be delivered in a timely manner? Are there quantity discounts? Alfalfa variety choices should be based on long- term variety performance information, not on the price of seed. Data for this yield analysis comes from the Alfalfa Variety Performance Database™ – 2000 (D.W. Wiersma and W.G. Hartman, Univ. of Wisconsin- Madison).